Most often the assessment is some type of educational test. Different types of online assessments contain elements of one or more of the following components, depending on the assessment's purpose: formative, diagnostic, or summative. Instant and detailed feedback, as well as flexibility of location and time, is just two of the many benefits associated with online assessments. There are many resources available that provide online assessments, some free of charge and others that charge fees or require a membership. OAS can be used for a variety of purposes. Students can gain valuable experience in becoming self-assessors, learning to evaluate their own work and educational progress. Parents can see the kinds of questions their children will be asked to answer on the end-of-year. Teachers can create customized tests as they complete instructional units or sequences of instruction. 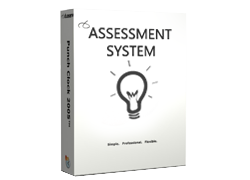 These tests can then be administered to individual students and/or groups of students to diagnose strengths and weaknesses, and to provide opportunities for enrichment and remediation. The OAS contains a large number of test items in reading for students in grades one through eight and high school, in English/language arts and mathematics for students in grades one through eight and high school, and in science and social studies for students in grades three through eight and high school.